Cars are no longer just men’s talk – men and women are equally likely to switch to electric vehicles, but often for different reasons. EV advocacy messages need to be more inclusive of both genders and all motivations for switching to electric. The poll was sent on 14 March 2018 to 537 electric Vehicle (EV) owners and 45 Plug-in Hybrid (PHEV, including Range Extenders) owners who have enrolled in the Flip the Fleet project • 313 EV and 19 PHEV owners responded by 19 March 2018 • 112 respondents provided comments for their choice. Nearly 60% of owners “agreed” or “strongly agreed” that men and women are equally likely to switch to owning an electric vehicle. Just over a fifth (22.6%) “neither agreed nor disagreed”. Of the remainder, nearly 17% “disagreed” with the proposition. 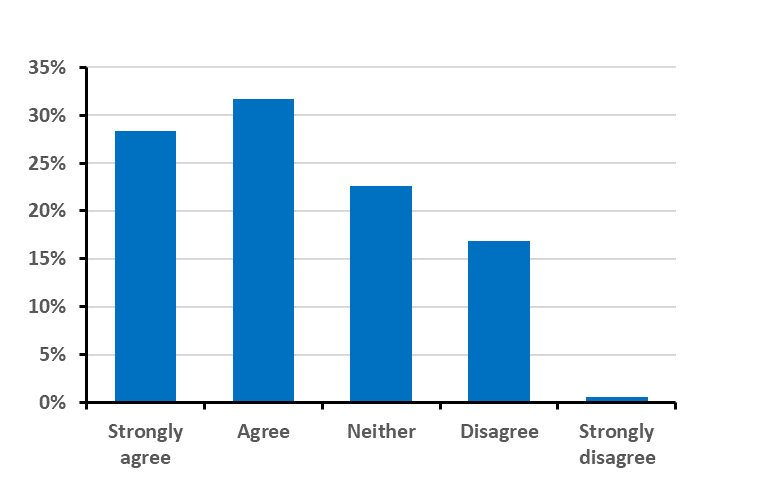 Only two respondents “strongly disagreed”. Why ask an uncomfortable question like that? Some respondents didn’t like this month’s 1-click question because they feared it would reinforce stereotypes and alienate some people. One said “People of any pronoun vary and generalisations could be bruising”. We get that. However, our main purpose in posing this statement was to raise awareness that our EV communication strategy must be fully inclusive to reach men and women, elderly and the young, the full range of the financial and cultural spectrum. Some women recently reported feeling excluded by the male-orientation of some of the EV group discussions on Facebook. Flip the Fleet was criticized for not including women to the same degree as men in their infographics. It was a fair cop – a retrospective analysis showed that a total of 19 males were depicted, compared to 4 females; and there were 14 males depicted as making statements compared to just 3 females. Actually, we do not know the gender and identity of who responds to the click surveys, so the quotes are assigned randomly by the artist to a figure. But the bias was strong and we missed seeing it before now. This feedback is an important part of our learning curve, especially when many women are leading the charge towards EVs. We wondered if a lot of other EV advocates are unintentionally talking past a key part of their audience. Also, however uncomfortable the question and your answers, at least this survey gets the issues out of the box to be talked about. This month’s survey rubbed in that most of you believe that women and men are about equally likely to switch to electric vehicles. A recurring theme was that women were more interested in EVs than traditionally they have been in ordinary cars. Many of you who disagreed with the statement reckoned that, if anything, women were more receptive than men to the concept of electric vehicles. Many inspired women and men are passionate EVangelists and working hard to educate others about all the benefits of EVs, including their environmental, financial and high-tech performance. Obviously support and openness to EVs is a matter of individual values and awareness. Nevertheless, some respondents expressed strong impressions that men and women, on average, did differ in why they were interested (or not) in EVs. And throughout you emphasized that even if men and women were equally likely to switch, they probably do so for different reasons. Several respondents felt that many women are more cautious with new technology, which holds them back in buying an EV. However, as EVs become a more familiar sight on the roads and the number of charging stations increases, we expect to see an even higher percentage of women buying EVs. The caution around new technology is possibly linked to heightened range anxiety amongst women. Many respondents commented that it often takes just one test-drive to convert a driver of an ICE vehicle to an EV – especially as many people are surprised by the quick acceleration and power of an EV – so their advice is simple: put a women or a man behind the wheel and the job is done. Traditionally, men may have been the main decision maker in buying cars – as in many other decisions around the home – but household purchases of EVs generally reflect women having a greater influence in the decision. They are therefore more engaged in their EV, including a basic understanding of how it works, than they may have been with their ICE vehicle, especially as they become familiar with charging it and monitoring its battery power. Many couples said that even if one partner had driven the switch to an EV, that they both now competed to drive the car. Only a small proportion said their wife was not happy with driving the car and this was mainly due to range anxiety. We believe that EV advocates need to target a wide range of potential buyers and to emphasise diverse reasons for why they are such an excellent choice. If advocacy continues to focus strongly on concern for the environment, the EV movement will quickly run out of customers. A number of elderly people are members of the EV Glee Club – congratulations are due to Mercury Energy for their recent TV advert that features two old blades on a night out in their EV! Younger people are particularly open to change – even if they are not buying yet, they might help turn their parents around. As one respondent put it: “The Kids “get it”… they plug in their phone, computer, headphones, etc… so why would you not plug in your car?” And one of our Facebook critics suggested that we should pay more attention to including other sorts of diversity, like ethnicity and culture in how we craft the messages and show the people who have made the shift to electric. Even though the majority of respondents thought men and women were about equally likely to switch to electric, there were some strongly expressed views that men and women do indeed differ in the ways they see the issues. So gender matters a lot for some of you, even though that group is a minority. Some of you pointed out the need for more detailed social research to help EV uptake campaigns, and that gender is definitely likely to be an important predictor of the success of the messages. Unbeknown to us when we launched this survey, the Energy Efficiency & Conservation Authority had already been doing some market research on the gender issue. They found that while men are more likely than women to consider buying a battery EV (31% in October-December 2017), interest from women is growing more quickly – up from 14% in October-December 2016 to 22% a year later. Clearly you were correct in identifying gathering interest in EVs by women, and your overall observation that women are an increasing and important part of the market was spot on. Your emphasis on individual variation rather than gender predictors suggests that EV marketing should not be targeted at any particular gender – just that it should take care to not exclude either gender and values –let’s make sure neither women nor men are left out. Advocacy should target range anxiety, through easy-to-read levels of information, helpful hints and even humour. Marketing also needs to address the difficulty for some men in letting go of the vroom-vroom. This is more than supposed insecurities around their macho image. Smells, sounds, the mere act of lifting the bonnet to check over the engine in the workshop takes a man back to working on his first car – almost a rite of passage for a young Kiwi bloke who grew up in the 1970s. The attachment to vroom-vroom will soften as the next generation comes through. The EV market needs to be ready to engage these men so that owning an EV car is a new way of enhancing their self-image. Inspiring women like Dee West, Kathryn Trounson, Pam McKinlay, Sue Pugmire, Megan Reynolds, Margaret Baker and Chelsea Sexton are just a few of the many examples of women EV community leaders and opinion makers. But how many EV dealers have women on their forecourt selling their cars? How many adverts and magazine presentations feature women in the EV driver’s seat? We urge that we make women more visible as sellers, EV service people, experts and spokespeople – and Flip the Fleet needs to include more women speaking up loud in its Infographics and co-presenting its results! Below is a lightly edited and re-arranged record of many of the comments received. Men are still struggling to grip the EV world? Women are more prone to range anxiety? Women are more wary of new technology? Women are particularly receptive to EV’s environmental benefits? “Fewer women are petrol heads and are more open minded” ● “Some (not all) men seem to be more ‘petrol head’ than women” ● “I believe men are more reluctant to change – not being a petrol head” ● “Ken thinks men may tend be a bit more “petrol head” in their thinking!” ● “Men are more likely to be “petrol heads” and like the sound of an engine. These are just opinions and have no statistical validity” ● “Basically I believe females are a bit greener and environmentally cleaner. Blokes tend to be a bit more petrol head, grunts diesel. EVs for work rather than for play? Men are more likely to switch? … or coupled buying power? Just give the man or the woman a test drive! What a silly question you asked! Your comments are gems. Keep them coming.